Look at the miniature flags. 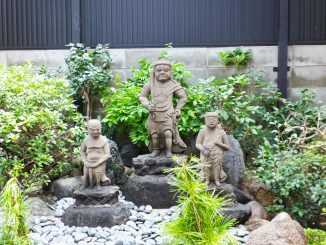 They stand about 35 centimeters tall. 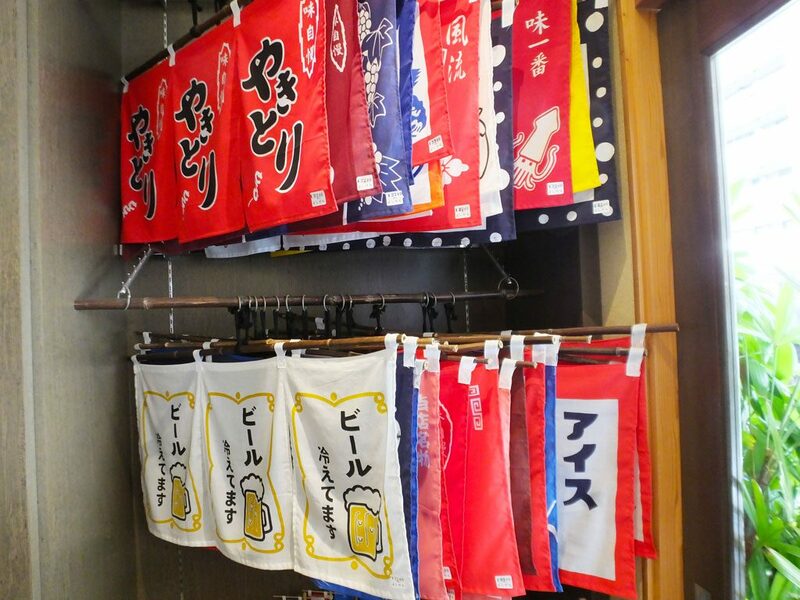 While restaurant owners come and purchase bigger ones for business purposes, foreign tourists and young Japanese people buy them just because the mini flags with Japanese words on them look interesting. 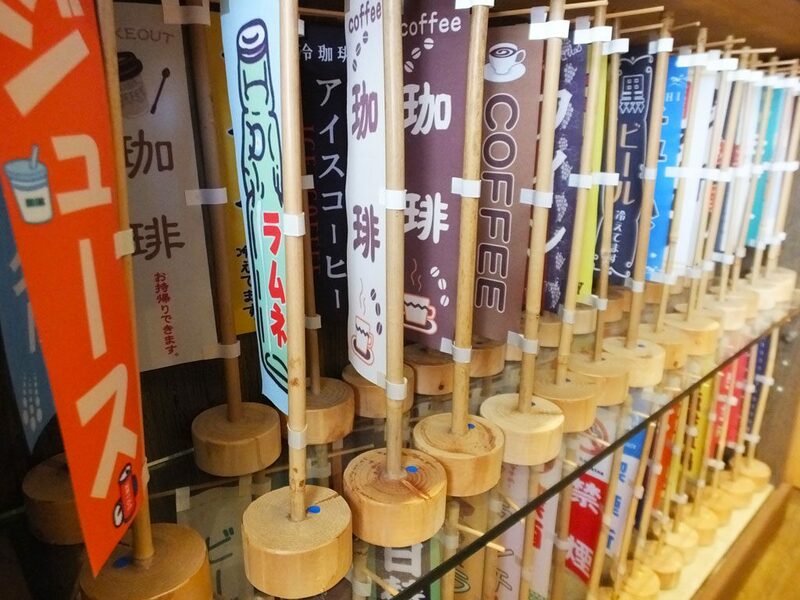 I saw Japanese words meaning “coffee,” “juice,” “beer” and “no smoking.” Also they have flags for festivals and special events like “miniature golf,” “quoits,” “a lottery drawing” and so on. Hanging banners are amusing, too. 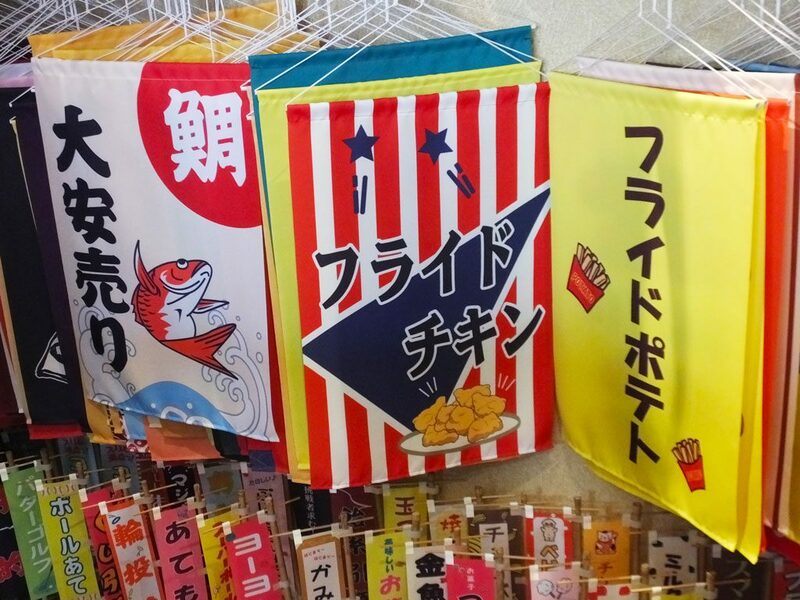 In the next picture, the Japanese words are: “bargain sale,” “fried chicken” and “French fries” in order from the left. The prices are about 2,000 yen or lower, so maybe it is a good idea to buy and hang one in your kitchen. It must be funny. Speaking of “funny,” a famous comedy duo, Ginshari has come to the shop. 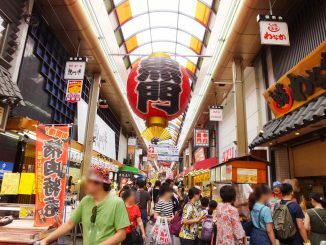 Osaka is often described as a city of comedy, because a lot of comedians live and work in Osaka. 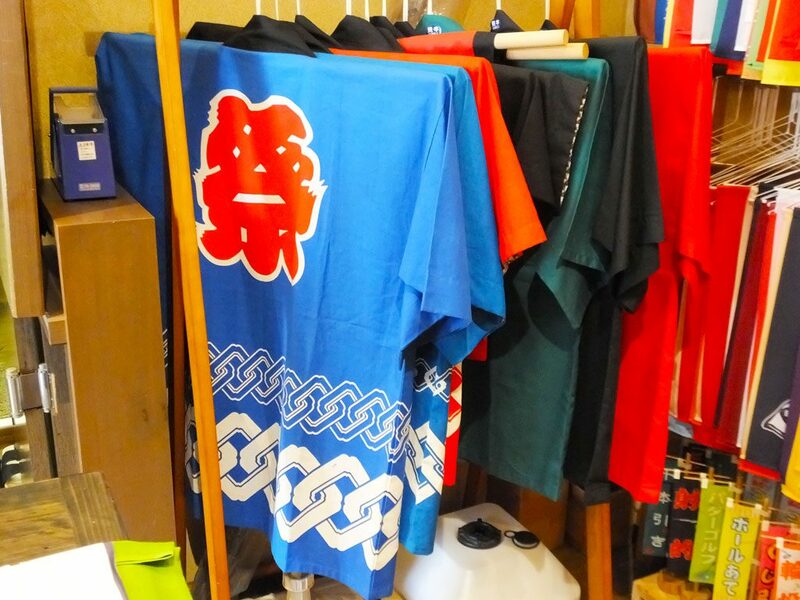 When you walk around a city in Japan, sometimes you can see a noren short curtain hung in front of an entrance of a store. I think noren are very Japanese things. 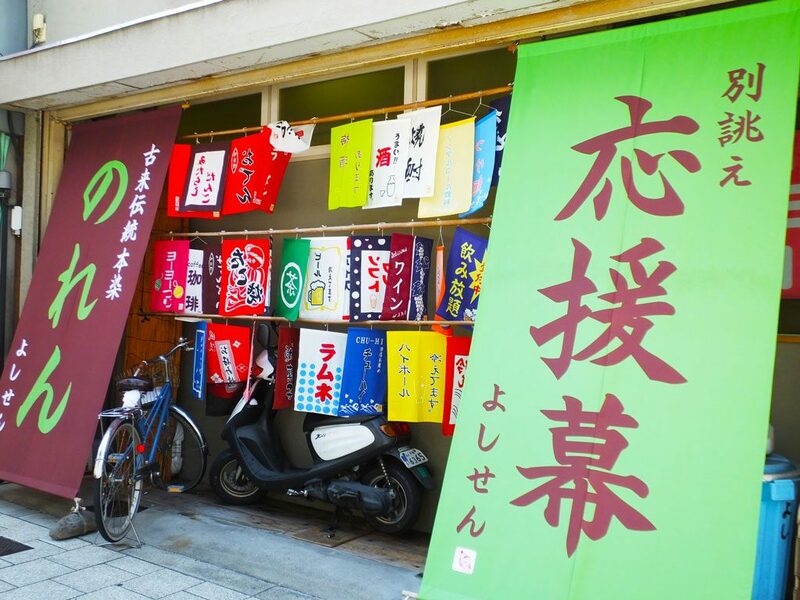 Usually, even Japanese people don’t buy them if they are not store owners, but not at this shop. 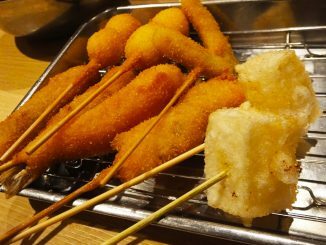 As you see a wide variety of noren, they will become more and more attractive. Then an idea will come to your mind―why not buy one? It’s strange, but true. By the way, do you know happi? Happi are traditional Japanese coats that are commonly worn at festivals and special events. 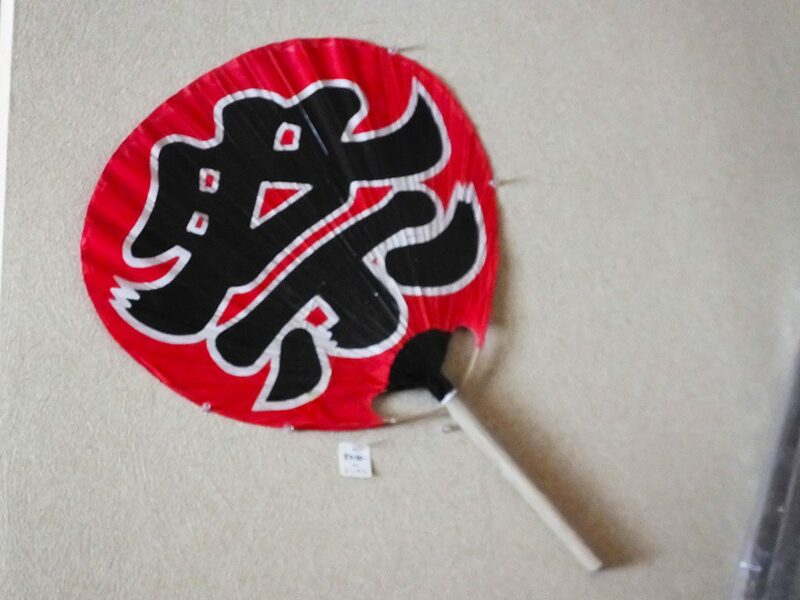 At Yoshisen, you can even buy happi and traditional Japanese fans called uchiwa. A Chinese character (kanji) of “festival” (Japanese: matsuri) is printed on both of them because they are used to warm up festivals. Yoshisen is a very fun and unique shop, isn’t it? I’m sure you can find your own favorite here, so come and find great gifts for yourself, family and friends!